Dentures are one of the most traditional treatments available to patients that are missing some or all of their teeth. 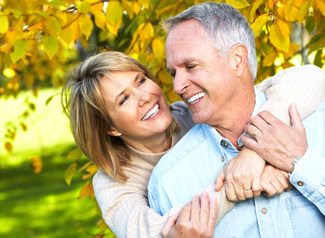 Our experienced dentists will help you find the best type of dentures to match your needs. Dentures and partial dentures are one of the most cost-effective ways for patients to replace all or some of your missing teeth. Full dentures cover the entire arch, while partial dentures clasp onto any remaining teeth to help secure them in place. Most dentures are made of a combination of acrylic and metal, depending on the location in your mouth. Depending on the type of denture you select, it may be delivered the same day as any necessary extractions are performed. Properly fitting dentures stay securely in place on their own, and do not require the use of dental pastes or adhesives. In order to extend the life and fit of your denture, as well as the health of your mouth, you should remove your denture every night. If your denture lifts or won’t stay in place when you talk or chew, then you may need to have your denture relined or have a new one made. With the advancements of dental implants, dentures are now becoming slimmer in their shape and profile when anchored to implants in the mouth. Implant retained dentures are typically held in place by four implants per arch. The denture covers only the arch of the bone, and stays securely in place after being fastened to the implants by our dentists. Some people call these “All on Four” dentures. This unique type of denture allows patients to affordably replace all of their teeth while still benefitting from the stability of dental implants. The design of the denture has such a low profile that eating, talking and smiling are much easier than with traditional dentures.